James Arnold Taylor and Matthew Wood reprise their roles in Star Wars™ Battlefront™ II. 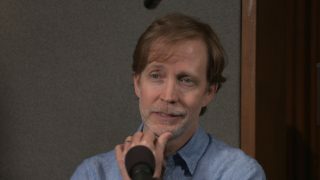 “Well, hello there.” James Arnold Taylor introduces himself – in-character of course – with the iconic Obi-Wan Kenobi line. James and his co-star Matthew Wood are back in the studio together, reprising their roles as arch-nemeses Obi-Wan Kenobi and General Grievous in Star Wars™ Battlefront™ II. Leading up to their characters’ clashes in game, we had the opportunity to ask them both a few questions about their roles and personal Star Wars™ journeys. Journey is, by the way, an appropriate word describing Matthew Wood’s history of working with Lucasfilm. 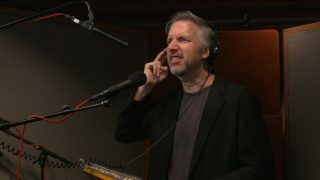 Matthew Wood recording his General Grievous for Star Wars Battlefront II. Matthew also does the technical post-processing of Grievous' voice. Since then it has just continued. He developed his career into undertaking highly technical sound work. Today, Matthew is the Supervising Sound Editor at Skywalker Sound, the sound division of Lucasfilm. But early on, he also knew that he wanted to act. Then, in 2005’s Star Wars™: Episode III – Revenge of the Sith™ and The Clone Wars series, he stepped into the shoes of General Grievous, using both his voice and creative post-processing skills to bring the character to life. Matthew mentions that General Grievous has, together with his arch-nemesis, sort of grown over the years – especially in the memes. “I think most that come up to me say: ‘Hello there’ (referencing the banter between Obi-Wan and Grievous) – that’s the first thing I hear from them! I love being part of the vernacular, it’s super exciting!” Matthew says. James Arnold Taylor has, of course, said that very line thousands of times. He’s the actor who’s played Obi-Wan Kenobi the longest, most notably throughout The Clone Wars animated series. “So uncivilized.” James Arnold Taylor delivers some classic Obi-Wan Kenobi lines – and some written specifically for Star Wars Battlefront II. James explains that his performance is a bit of a mix between the Ewan McGregor (prequel trilogy) and Alec Guinness (original trilogy) portrayals of the character. “I really felt that, for me to pay homage to both of these incredible actors that have played him, I needed to combine a little Ewan McGregor and a little ‘These aren't the droids you're looking for,’” James explains, changing his voice to one reminiscent of Guinness’ classic act. However, that doesn’t stop him sneaking in a little bit of James in his Obi-Wan as well. While recording voice lines for Star Wars Battlefront II – although James has made Obi-Wan his own – he couldn’t help but to slip more into Ewan McGregor’s performance sometimes. Especially for the lines made famous in the prequel films. So, what are some of the duo’s voice lines in Star Wars Battlefront II? You can experience what General Grievous has to say by booting up the game today, but our Community Transmission on Hero Voices also gives a peek of what’s in store for both him and Obi-Wan Kenobi. 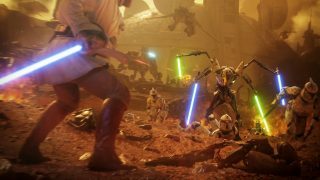 “You must realize, you are doomed.” General Grievous and Obi-Wan Kenobi facing off on Geonosis in Star Wars Battlefront II. Having worked on Star Wars for so long, it’s still special for Matthew to see General Grievous coming to life in Star Wars Battlefront II. 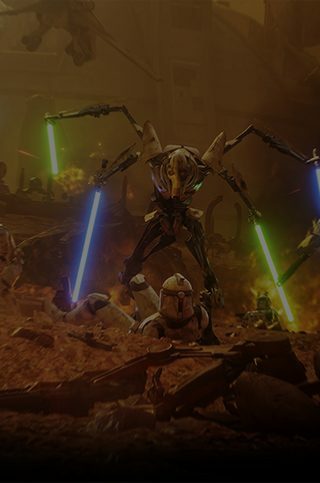 General Grievous* is available in Star Wars Battlefront II today, and Obi-Wan Kenobi* is set to arrive on November 28 along with the Battle of Geonosis Update**. Now, make sure to join the discussions on our official forums or on social – follow EA Star Wars on Twitter, Facebook, and Instagram. Also sign up today to receive the latest Star Wars Battlefront II news, updates, behind-the-scenes content, exclusive offers, and more (including other EA news, products, events, and promotions) by email.